The most immersive VR experience anytime, anywhere is only one click away with the VIVE Focus standalone VR headset. No phone required, no hassling with PC cables, no additional trackers needed. 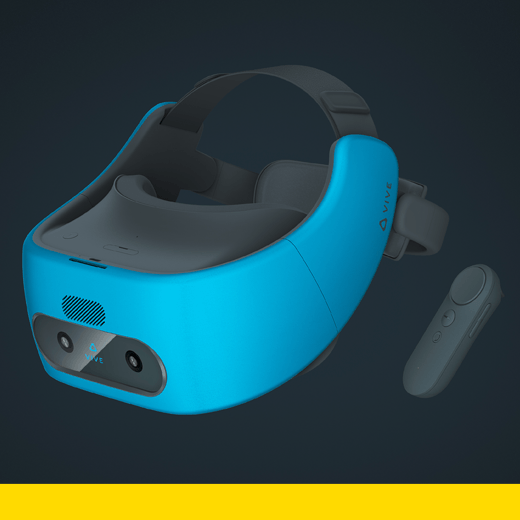 The VIVE Focus has a built-in battery, a highly efficient processor and stereo speakers. Its one-of-a-kind triangle support design distributes weight and pressure while still delivering a stylish design. The adjustable hinge design and the water-repellent faux-leather paddings provide the most comfortable wearing experience. This thoughtful design will fit seamlessly into the user’s own personal taste and lifestyle. The VIVE Focus is the first commercial standalone device equipped with the world-scale inside-out tracking (6DoF) system. The two front cameras sense the user’s movement, enabling the user to explore freely in both the virtual world and the real-world simultaneously without boundaries. The VIVE Focus pursues the ultimate goal of a seamless VR experience with unlimited freedom.